It started a few nights ago. Someone in a music production forum on Facebook posted a synthesizer advertisement from back in the day…a vintage synth. Before long, members of the forum were chiming in about what they remember about those days – things like they used that synth at one point, how it compared to others of its timeframe, etc. Even I pulled out a set of old music production user group magazines and posted a pic of them. This got me reminiscent of the first computer I was every able to purchase. The backstory (some of you may know) is when I started my professional career out of college, I was a young systems engineer working in a Naval satellite system program office. This office, surprisingly, had a mix of Macs and PCs. It was then, in 1988, when the Mac was only four years old, that my love affair with the platform began. Our business affairs guy was the keeper of the Macs in the office and it was through his enthusiasm and love for the platform that got me interested, not to mention (as I found out shortly thereafter), the magic of Apple. For the next two years, I dreamed of owning a Mac. 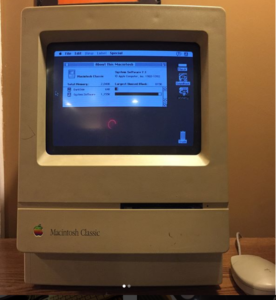 In 1990, I was settled into my own apartment (no more roommates) and was making enough to finally afford a brand spanking new Macintosh Classic. I purchased that computer for a whopping $1200 from a small computer shop in Silver Spring, MD. Until then, I was recording the music I was composing to a Tascam 424 multitrack tape recorder. Getting the Mac was way more exciting then most of you could ever imagine – it opened up the world of music sequencing and facilitated greatly how I composed music. It was also the first time I was able to connect to BBSs online via a blazing fast 2400 bps modem (LOL). Since that Mac, I’ve had many more, some of which I still have in storage, some not, but it was that all in one Mac, the 9-inch B&W, the tiny sequencer, MasterTracks Pro, and a lot of other things during my early journey into using a computer for music production, that leave me with fond memories. Two nights ago, I pulled it out of storage, set it up, turned it on, and set it in my studio. A little, but well know screensaver called Darkside, was installed. I set it to fade to the “Kitten” screensaver, a little spunky kittne that ran around the screen chasing a ball of yarn. A lot of memories came flooding back, especially those of what I could do with so little hard drive space and processing speed compared to what I have today. Having to load programs via 3.5-in floppy disks, and all the other charming things that only Apple could make you experience. Last night, when it was appearing everything was fine with it, I decided to move it. I went to shut it down via the shutdown menu, but the mouse froze on the screen, along with the kitten. All I could do them is manually shut the power switch off. When I turned it back on, the video screen essentially malfunctioned. An awful looking pattern was now frozen in place. I repeatedly turned it off and on, trying to see if that issue would fix itself. I followed my a short shake, then firm pounding on both sides, as if I was trying to resuscitate it. All of that…amounted to nothing. It was no more. Interesting how attached we can become to inanimate objects. While it wasnt necessary the object itself, it was more the memories attached to using it, the things I was able to accomplish during the beginnings of a journey that I’m still on. I admit that I miss it, despite the fact it was sitting in storage for years, despite the fact that the Macs I use for music production now are vastly superior to it. I just miss it…call it tech nostagia. Today, after some research, I’ve decided to purchase another for posterity. For an original price of $1200 I paid 27 years ago, I’ve seen that computer in flea markets and classified ads selling for as little as $20. On eBay, one in good condition is well over $250. I won’t spend that much, but I’ll continue to research, continue to look around and just maybe, a sort of resurrection of sorts will occur one day in the hopefully near future. 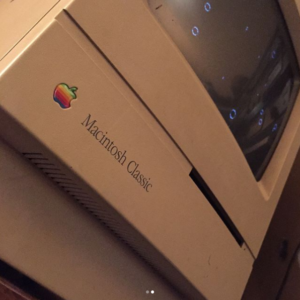 This entry was posted in Apple, Macintosh, Music Production/Studio Recording, Technology and tagged Mac Classic, Macintosh, music production. Bookmark the permalink.